ice warriors | Randomwhoness: a Doctor Who blog by Johnny Spandrell. Sampling stories in random order. So, it’s 2017 and Mark Gatiss wants to write an episode with Ice Warriors and which refers back to the Pertwee era at every available opportunity. The real question is, why aren’t we on Peladon? Surely with Brexit looming, here’s a chance to return to Doctor Who’s long tradition of commenting on current political issues. Not to mention a chance to return to leather-clad soldiers, badger wigged extras and furry subterranean beasts. There could be a Nigel Farage style villain as the inevitable high priest. It’s The Exit of Peladon (well, they surely would never call it a Pexit).C’mon, add an unconvincing fight scene for the Doctor and we’re there! But of course, it wasn’t to be, and with good reason. For one thing, it’s just too obvious. For another, the BBC wouldn’t dare court controversy on such a hot topic with its own existence and remit so politicized at the moment. And for a third, Doctor Who can just be more subtle than that. Even though it’s not The Exit of Peladon, this story has been influenced by Brexit, and has much to say about nationalism. In fact, there are a few different isms to navigate through here, all of them embodied in the group of Victorian-era soldiers camped out in the Martian underground for this story. Their nationalism – putting Britain’s interests (however they are interpreted) first – is inherent. It’s these characters’ starting point. From there, they, particularly the fervent Catchlove (Ferdinand Kingsley), also exhibit imperialism – the belief that the British empire should extend its reach through acquiring new territories. And through their treatment of Friday (Richard Ashton), they also show their colonialism, a belief in the inherent cultural superiority of a colonial race of people over an indigenous people. Brexit may not, at heart, be about imperialism or colonialism, but I think it’s fair to say it’s about nationalism. It’s reflecting a political swing towards right-wing nationalism around the world, whose other expressions include Trump, Le Pen and here in Australia, the resurgence of One Nation. Don’t worry, randomers, this isn’t about to get super political. But I’m saying that this is the environment that Empress of Mars was made in. And if its basic message, unsubtle as it is, is “colonialism is bad“, it’s underlying theme is, “and so is the nationalism it springs from“. This critique of nationalism shows up in the soldiers themselves. They’re a rum lot, and that’s for sure. Godsacre (Anthony Calf) is a coward and a deserter. Catchlove, a warmongering zealot. Jackdaw (Ian Beattie), a pillager. (His thieving of a small blue crystal from the Ice Queen’s tomb is not just a call back to Metebelis, but a potent indicator of invading forces wanting to take a land’s natural resources for themselves). Fine and upstanding examples of her Majesty’s army, they are not. They fit the stereotype about Britain’s colonial forces, in that they were not always made up of the best soldiers available. As symbols of Britain’s colonial past, their personal shortcomings reflect poorly on nationalism as an idea. Greed, treachery and conflict spring from this, this story says. It’s not all that different from Gatiss’ last Ice Warrior story, Cold War, where a bunch of Russian submariners, some good, some bad, came up against the physical and technological might of the Ice Warriors. All out war loomed, but there the Doctor convinced the Martian General to leave in peace. The two opposing forces walked away from that flashpoint. Here, something quite different happens. As fighting breaks out, Friday undermines his own side to argue the Earth soldiers’ case. And Godsacre kills chief hawk Catchlove, and pledges allegiance to a new queen, Iraxxa (Adele Lynch). It’s another twist on the theme of “it doesn’t have to end in war” and it shows the complexity in the characters of Friday and Godsacre. But whereas the Cold War Russians are allowed to float away, pride more or less intact, here the British soliders capitulate. It’s a funny ending. What life can those soldiers expect on Mars? A short and uncomfortable one, probably. But over and above that, it’s a repudiation of imperialism; they came as conquerers and stayed as servants. It’s also a rejection of another ism: isolationalism. Rather than struggle against the inevitable, these men choose to interact with their interplanetary neighbours. Perhaps a partnership between the Martian and um, Earthian forces, rather than a submission to sovereignty might have been a more satisfying ending, but still the point is made. Plus, it adds a wry double meaning to the former war cry of “God save the queen,” now repurposed as a castaway’s rescue call. Reach out, this story says, rather than fight back. Still, things might change again. In a shout out to remainers and Doctor Who fans alike, the story ends with Mars making contact with the Galactic Federation, the Pertwee era’s version of the EU. Who knows what will happen when Alpha Centauri (Ysanne Churchman) and its pals arrive? Mars is up for membership and maybe Godsacre and his men will be the freed from their allegiance to the Queen to become Earth’s first representatives at this union. Their horizons are about to expand far wider than they ever imagined. It’s may not be The Exit of Peladon, but we know where Empress of Mars’ sympathies lie. LINK to The Bells of St John. It features a monster from Classic Who Season 5 (which, as it happens, will work for our next story too), but why stop there? Why not include the links to The Curse of Peladon, The Monster of Peladon(mining equipment as a weapon, anyone? ), Day of the Daleks (RHIP), The Green Death (Jackdaw stealing a blue crystal), The Tomb of the Cybermen, Tooth and Claw, Sleep No Moreand a line which sounds suspiciously like one from The Robots of Death. (“They could slaughter whole civilisations, yet weep at the crushing of a flower. “ cribs “It can punch a fist sized hole in six inch armour plate or take the crystals from a snowflake one by one”). Then there’s The Thing, Zulu, The Terminator, The Vikings, Star Wars and freakin’ Frozen. A parliament of references! NEXT TIME: Stubborn old goat! We’re caught in The Web of Fear. Is Jon Pertwee’s Third Doctor, he of the sweeping capes, velvet jackets and patrician tone, anti-establishment or deeply embedded in it? Some people (late producer Verity Lambert among them) have argued that by aligning himself with UNIT and setting up base on Earth, the Doctor became part of our society’s power structures and quite different to the anarchic force for change he had been previously. Others (like writer Gareth Roberts) have argued that he’s utterly anti-establishment, that barely a story goes by without him clashing with bureaucrats and soldiers and anyone who represents the powers-that-be. I’m not sure that being anti-authority precludes you from being part of the establishment, but I think the Doctor’s flamboyant presence among the suits and uniforms around him is a potent contrast. If the Doctor has sold out, it doesn’t sit comfortably with him. You could read it either way. But it surprises me to find on this random trip through Who that the more I see of him, the more it’s clear that the Third Doctor is a tricky character to pigeon hole. Most recently, I’ve accompanied him and dolly bird assistant Jo Grant (played by dolly bird Katy Manning) to the stormy planet of Peladon. It’s only the second time the Doctor has managed to slip the Time Lord shackles which have grounded him on planet Earth, so it’s a rare trip to another world. But while in the confines of a UNIT laboratory the Doctor may have sneered at enough civil servants to convince us he’s still a maverick at heart, I have to report that once on Peladon, he becomes a resounding advocate for the establishment. Peladon is a rustic kind of place. Its cavernous citadel is lit by fiery torches and its soldiers dress like Romans and carry swords. It’s governed by a King, who’s advised by long robed lords. Like its mascot, the furry fanged beast Aggedor, Peladon’s an untamed beast. But civilisation beckons, in the form of a Galactic Federation of planets. To assess Peladon’s application to join the Federation, representative delegates have been sent, all of them green: Ice Warriors, Arcturus (an alien head in a mobile jukebox) and Alpha Centauri (a phallic hexapod). The Earth delegate is missing, but the Doctor is on hand to adopt the role. And he’s clearly a method actor, because he utterly embeds himself in the part. So much so, that he adopts an unquestioning support for Peladon joining the Federation. So fervent is his belief in this cause, he seems to forget that he’s not actually there to ensure it happens. DOCTOR: You slap the Federation in the face by sabotaging the commission. Why? DOCTOR: Afraid? Afraid of what? The Federation is your safeguard. HEPESH: That is not true! I know the Federation’s real intent. DOCTOR: The Federation’s real intent is to help you. HEPESH: No! They’ll exploit us for our minerals, enslave us with their machines, corrupt us with their technology. The face of Peladon will be changed, the past swept away, and everything that I know and value will have gone. DOCTOR: The progress that they offer, that we offer, isn’t like that. How does he know? Does he know about the Federation from some previous adventure? If not, how can he be so sure it’s the benign force for progress he paints it as? Hepesh’s argument, though paranoid and fear-driven, might have some merit. Unusually for the Doctor, he doesn’t give the other side of the argument any consideration. Compare this to Curse‘s Season Nine stablemate,The Mutants. In that story, the planet Solos is fighting for its independence from an imperialist regime. In that adventure, the Doctor is firmly on the side of self-determination. Sure we’re dealing with two different allegories here; The Mutants rails against colonialism, whereas Curse reflects tensions about the UK joining the European economic community. Peladon is making a choice of its own, whereas Solos is occupied. But still, it’s odd to see the Doctor urging one society of strength in unity, while pointing out to another the strength of standing alone. I suppose though it depends what we’re calling ‘the establishment’. The Doctor is certainly against Hepesh’s attempts to keep Peladon shackled to tradition and the old power structures. In this sense, he’s a true advocate for change and firmly questioning the wisdom of sticking with the status quo. But I can’t help wondering how Peladon’s going to fare in this galactic federation. It’s a feudal society, lacking in technological sophistication but rich in natural resources. Surely there’s a possibility it’s going to extorted and bullied by its more advanced co-signatories. Hmm Doctor? Hmm? Curse has a sequel, the quite similar, but two episodes longer, The Monster of Peladon. It concerns itself with rebellious miners mostly, so perhaps writer Brian Hayles missed a trick. What if 50 years later, Peladon finds itself wanting out of the Federation? What if Hepesh’s fears were borne out? The Doctor would have to face the consequences of his actions and perhaps strive for the opposite outcome he sought in Curse. There’d have to be Ice Warriors and Aggedor and funny hairstyles, natch. At the end of the adventure the Doctor tells Jo that he suspects their arrival on Peladon was no coincidence. He reckons it was those wily old birds the Time Lords sending him on another mission. What possible benefit they see in Peladon joining the Federation remains unknown, but they had their man in the field go and sort things out. Once again, the Doctor’s on hand to do the establishment’s bidding. Whether he likes it or not. NEXT TIME… You might want to find something to hang on to. It’s back to not blinking for The Time of Angels/Flesh and Stone. 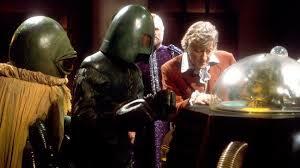 AND ONE LAST THING… The Curse of Peladon means that Season 9 is the first season to be completed on Randomwhoness! You can find links to its stable mates, and indeed all my posts, right here.